Application made to Corporate Registry to form the Nanton Lancaster Society. 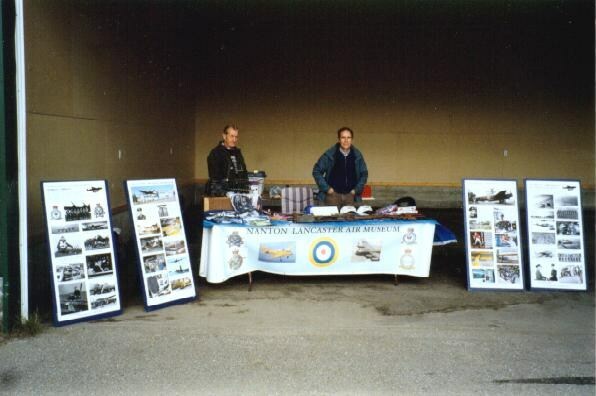 Nanton Lancaster Society is Incorporated. Inaugural General Meeting and the election of the first Board of Directors and Executive. Displays in Tourists Information Building. Society’s objective identified as the creation of a museum with the Lancaster as the centrepiece. Membership of over 500 reported. Open Bomber Days (First guided tours of Lancaster). Six Anson’s acquired in a single day (Operation Annie). First Summer season featuring guided tours of Bomber begins. NLS float in Stampede Parade. (received honourable mention). 15,000 Visitors reported during summer season. Decision made to dedicate Lancaster to S/L Ian Bazalgette VC-DFC. Third annual “Open Bomber Days”. Opening of expanded display area in Tourist Information Booth. CWH Lancaster flies over Nanton. (building to provide immediate protection for the Lancaster). Square footer and Lifetime Memberships available to promote funding for new building. Planning for Bazalgette Dedication Day begins. Committee formed to plan building construction. Six more Anson’s acquired (Operation Annie II). phase II to include electricity, heat, etc. phase III to include concrete floor. Chinook Singer’s and Player’s perform “Wish Me Luck” by Alvin Berger. Decision made to proceed with construction of both wings on building. Lanc moved into museum building. Decision made to complete interior of display wing. Rutherford print delivered to the Society. Museum displays moved from old Tourist Information. Bldg. to new museum. Grant received to complete restoration shop. “Open House” held at new museum for local residents. “Official opening” of the Nanton Lancaster Society Air Museum. First portion of concrete floor in main hanger is poured. Hangar floor concrete completed; interior of hanger walls completed. Presentation to the society of Torger Taerum’s medals. (This fully operational Rear Turret display was restored by members of the Calgary Chapter). Fiftieth Anniversary of Dambuster’s Raid Commemoration. Official opening of front shop. Decision made to look into the possibility of producing a video for the museum. Crash Truck donation and restoration. Have to loan Vickers to Edmonton (need expansion). CF 100 Acquired from Suffield and mounted outside museum as gate guardian. SAIT students begin work to produce short documentary. Society unveils display commemoration the 50th anniversary of the Sinking of the Battleship Tirpitz. SAIT students resume work on documentary project. Decision made to proceed with funding for Museum expansion. Decision made to restore the Lanc’s starboard inner engine. The Museum goes On-line! with our web site. Begin planning for expansion of museum. The Nanton Lancaster Society’s first published book becomes available. ‘BAZ’ is a biography of Squadron Leader Ian Bazalgette VC DFC, a Canadian Victoria Cross Recipient. School Band concert held in museum for first time. The Video “On The Wings of a Lancaster” produced by the Students from the Southern Alberta Institute of Technology was unveiled to the public. Presentations were made to all the students involved with the project and to other people who helped out with the project. Special presentations (a copy of the video) were made to the actors and all people who appeared in the video. Fabric work completed on Fleet Fawn. Canadian Armed Forces 431 Air Demonstration Squadron (The Snowbirds) fly over Nanton. Society’s tenth anniversary “A Salute To Those Who Served” commemoration day. Memorial unveiled by His Honour the Lt. Governor of Alberta, the Honouralble H.A. “Bud” Olson. Flypast of two CF-18’s and the Confederate Air Force (CAF) B-17 “Sentimental Journey”. Banquet and dance held in arena for the first time. Restoration of 6 wheel drive Fire Engine completed just in time (a matter of a few hours) for “Salute To Those Who Served” parade on July 27th. 7200 square foot Museum Building Expansion Underway. Second Annual School Band concert held in museum. Restored Fleet Fawn placed on display. Bolingbroke #9899 arrives at the museum. Beechcraft 18 ‘Expeditor’ placed on display. 1941 RCAF ‘CWT’ truck donated to the museum. BCATP fuel bowser placed on display. T-33 Silverstar placed on display outside the museum. Lancaster cockpit canopy framework rebuilt. Society hosts the Canadian Aeronautical Preservation Association Conference. Restored Blenheim IV cockpit section placed on display in memory of Sgt. Albert Prince. Working Lancaster undercarriage placed on display. Lancaster navigator/wireless operator table restored. 1200 square foot storage area opened. Restored Blenheim IV Bomber placed on display in memory of Barry Davidson. Restored, operational Link trainer placed on display. Canadian Aviation Historical Society Conference visits the museum. Bruce Warren Memorial Garden dedicated. “Women at War” display opened. Front turret and Bomb Aimers perspex completed. Nanton Cenotaph relocated to front entrance of the museum. Display honouring the Dutch Resistance opened. 480 square foot expansion completed to enlarge the museum’s front entrance. Four additional doors installed to enable the Lancaster to be rolled outside. Aircraft Nose Art Display opened. Tallboy Bomb replica constructed and placed on display. Lancaster FM-159’s starboard-inner engine was “run-up” after a two year restoration project. Canada’s Bomber Command Memorial was placed on the front lawn of the museum and dedicated. Former Snowbird Tutor #114177 acquired. Museum members took our travelling display and our message to the EAA Airventure in Oshkosh, Wisconsin, USA. Tutor #177 was restored, painted in Snowbird markings, unveiled at the Rocky Mountain House Air Show, and then placed on display in the museum.